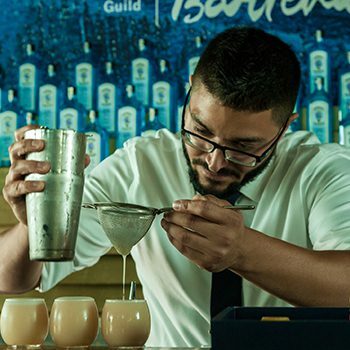 The United States Bartenders’ Guild (USBG) has announced Schuyler Hunton of Tiger Mamas as the winner of its North American ‘Most Imaginative Bartender’ competition. The honour was bestowed at the USBG’s 10th Annual Most Imaginative Bartender competition, sponsored by Bombay Sapphire, which took place at the Mondrian Hotel in London. This is the first year the competition has taken place in London, in celebration of the competition’s 10th anniversary. After a competitive three-day cocktail throwdown against ten top bartenders from across North America, Hunton took home the victory with his winning drink ‘Breakfast in Bombay’. The winning cocktail contains Bombay Sapphire gin, compound grapefruit earl grey oleo, lemon juice, and egg white. Hunton was also named the People Choice Winner for the evening and will feature on a special edition cover of GQ’s December “Men of the Year” issue. The night showcased an inspirational art gallery, “10 Years, 10 Cocktails,” filled with portraits of the past nine winning recipes crafted from paints created from their corresponding cocktail ingredients. As a result, Hunton will embark on a trip to Tuscany to learn about the botanicals that make up Bombay Sapphire gin.